Shopkick: Earn gift cards for walking into stores and scanning products! So, I’ll be honest. I signed up with Shopkick a few years back when it was brand new, and I never really did very much with it. Just recently, I’ve gotten excited about it again, though! 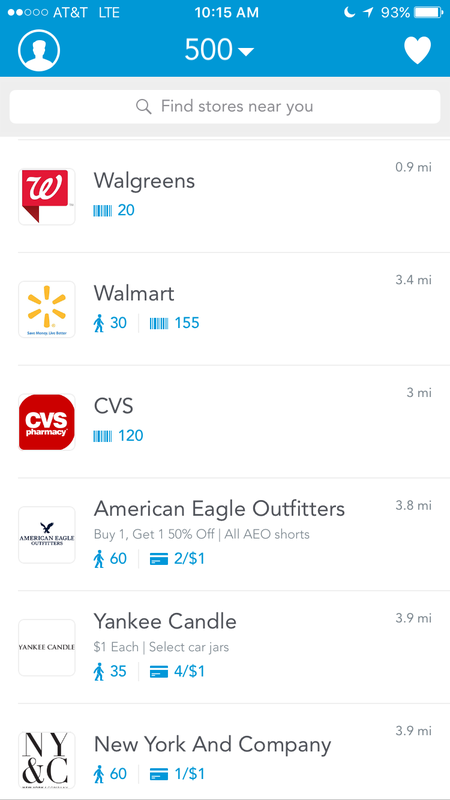 I love Shopkick, because it’s something you can do on the side while you’re already out running errands or getting shopping done. It almost becomes a treasure hunt of sorts, and it’s super fun for the kids! You can also earn kicks for scanning product barcodes — no purchase necessary! There are other ways to earn, such as purchasing products that offer “kick bates,” but I don’t bother with linking up my debit card to the account. Here’s the cool thing, by simply walking in to stores and scanning products, you can easily earn at least one $5 gift card per week! I recommend that you only Shopkick at stores that you’re already planning on shopping at, or that you’re nearby when you have a few extra minutes to spare. I’ve noticed that there are higher value bonus kicks on the weekends. Consider getting a group of frugal-minded friends together for a fun, free afternoon of Shopkicking. It also gives you good exercise from walking around shopping centers! 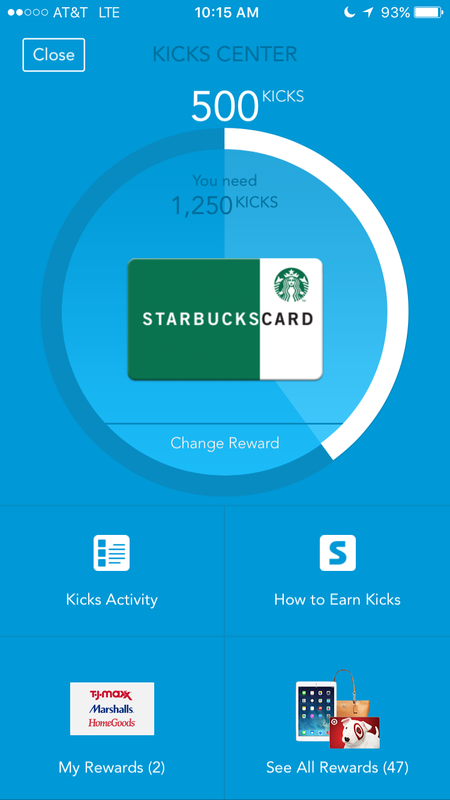 It’s super easy to redeem your kicks for rewards in the app. Just select which reward you want to try to earn kicks towards, and the app will let you know when it’s time to cash in! It’s SO simple. And there are some great rewards to choose from, including Starbucks, TJMaxx, Target, Walmart, Old Navy, Best Buy, Lowe’s, Macy’s, Barnes & Noble, and more! Sign up here with Shopkick to get started. I love how to turned Shopkick into a verb. Ha! I love Shopkick! I’ve got my mom hooked on it, too. ? I love Shopkick and have been using it for years to get Target gift cards. how long does it typically take to earn a giftcard? If you’re a person that’s out and about a lot, it may only take a few weeks to get a $5 or $10 card. You do need to know that after you’ve gotten walk in kicks so many times, it will max out and you’ll have to wait a specified time period before you’ll get more. Each participating store is different. For example, I was at Yankee Candle and got walk in kicks once. I looked it up again about a week later and saw I’ve maxed out and won’t be eligible for walk in kicks for 30 days. They’ve added some great locations for kicks: Sam’s Club, Kroger, Meijer, etc. It makes it really easy to earn them quickly. You will not be allowed to earn kicks on multiple phones for one account. I know when I got a new phone and signed into my account, it popped up immediately with a “we see you’ve logged into your account with a different phone. You will only be able to earn kicks from one mobile device” message. Do you have specific instructions for Shopkick on your site? 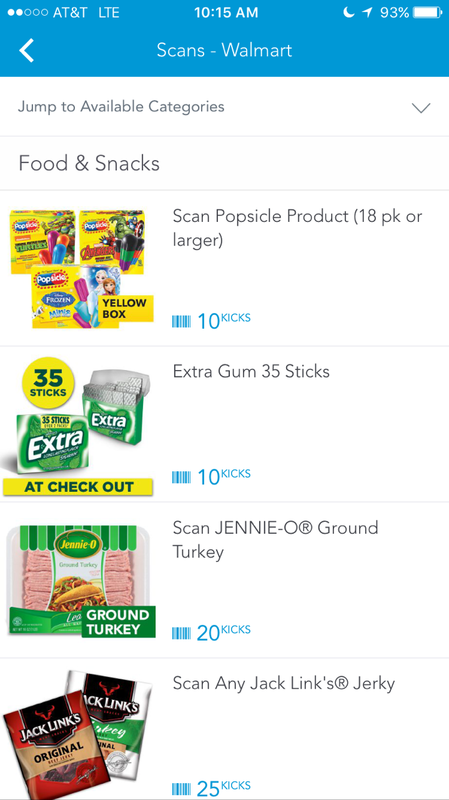 I’m missing something…I don’t see a list of stores that participate, what to do when I enter the store to get points, How to know which items to scan,wha to do with the scanned images, etc. Does anyone know if you can do it by using the store’s wifi instead of bluetooth? I have an ipod, but not an iphone. I loved the idea of Shopkick and signed up a while back. However I use Republic Wireless as my carrier and the phone number is considered a landline number (since it uses voice over IP) and Shopkick won’t recognize a landline number. I contacted Shopkick, and they said there is nothing they can do at this time to change this. Just a heads up for any Republic Wireless users as the app let me accrue points before I tried to register and discovered this!